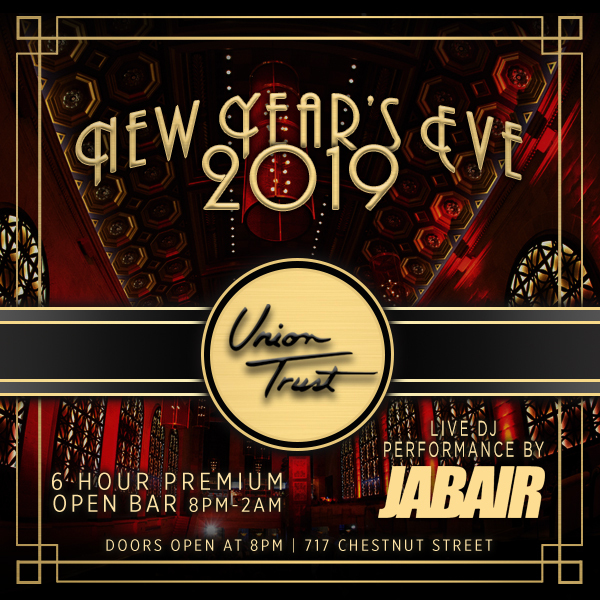 Philadelphia’s Union Trust is a magnificent venue that will deliver an all-out New Year’s Eve event this holiday season. Come party the night away with Philly’s sophisticates at the grand Union Trust, the perfect blend of historic elegance and contemporary ambiance. Prepare to be blown away by this exquisite, fully-stocked affair. Indulge in a premium six-hour open bar and the selection of gourmet buffets as you take in the splendid space. A live DJ will be spinning an eclectic mix of high-energy music to help you dance your way into the New Year. At midnight, revel in a live countdown and a complimentary champagne toast to really start your New Year with a bang. For the optimal New Year’s Eve experience, try one of the VIP packages offering reserved seating, priority admission, and more. Union Trust is a renowned architectural marvel in the heart of Philly’s vibrant Old City District. You’ll be engrossed in this extraordinary atmosphere as soon as you enter the striking hand-carved doors; the venue’s true extravagance is in full display in the appropriately named Grand Hall, where towering ceilings and a dazzling centerpiece of a massive crystal chandelier speaks volumes. Originally built in 1850 as the Girard Corn Exchange Bank, Union Trust boasts 10,000 sq-ft and two levels of elegant oak flooring with spectacular floor-to-ceiling windows. The grandeur of Union Trust radiates a lavish yet intimate ambiance, taking best of both classical details and modern performance. Union Trust will truly have you celebrating New Year in opulent style. Philadelphia’s best year-end party is taking place at Union Trust. Come and celebrate this New Year’s in the lap of classical extravagance and modern luxury – secure your tickets today.